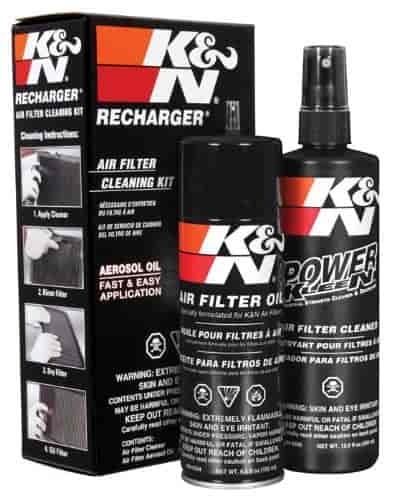 K&N Recharger Filter Care Kits bring back the performance of your filter and your engine. Cleaning away the dirt and road grime, re-oil the cotton gauze filter with K&N oil and you are back to making horsepower while protecting your engine. 99-5000 is rated 4.5 out of 5 by 2. Rated 5 out of 5 by Old Vet from It's just what it says it is, a recharger kit, a m I own a GMC Serria with the Duramax diesel. It has 223,000 miles on and has had the K & N filter since it hit the road. taking care of the filter is a must, and depending on the conditions, how often it should be used. Note, DO NOT short cut the directions to get the most out of the kit. Rated 4 out of 5 by Tom396 from Value Just couldn't see not using the stuff actually made for the job.